Florida-based female-fronted power metallers SEVEN KINGDOMS have parted ways with bassist Miles Neff. It was a mutual agreement on behalf of everyone for the benefit of the band. Miles will be working in his other various projects so be sure to check them out. Says the band, "As one royalty steps down, an open throne remains. We would like to welcome new bassist of Seven Kingdoms, Aaron Sluss, to take a seat! Aaron has already shown a drive to perform exceptionally and make the band better as a whole. We are very happy to have him on board and think many good things will come from this decision." "I've been good friends with the members of Seven Kingdoms for some time now, as well as a fan of the music," Aaron says, "so when Camden asked me to come on board as their new bassist I didn't hesitate. There is a lot of musical talent in this band and I'm very much looking forward working with them on the upcoming Blind Guardian tour and in the time beyond." 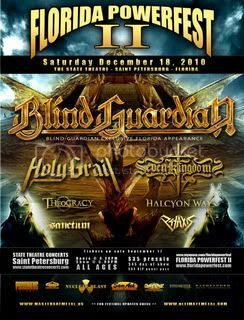 Seven Kingdoms are among the acts confirmed for Florida Powerfest II, taking place at the State Theatre in Saint Petersburg, Florida on December 18th. Tickets are on sale via Ticketmaster. Further festival details at this location.